Chidinma Inspirations: How Bad Do You Want It? This is what the words in the picture above says ''Four years ago, I was just a guy who had a crush on a girl, who had a boyfriend. And I had to do the hardest thing that I ever had to do which was just to wait. And, a lot of people told me I was crazy to wait this long for a date with a girl I work with but I think, even then I knew that I was waiting for my wife - Jim Halpert''. Sometime last year, a Pastor said something that caught my interest pretty bad. He said ''God never ever says NO to His children. He either says, WAIT or NOT YET or YES''. Many a times, when we are in dare need of something, we go about it the wrong way, thereby doing whatever it takes to get it even if it means hurting others. 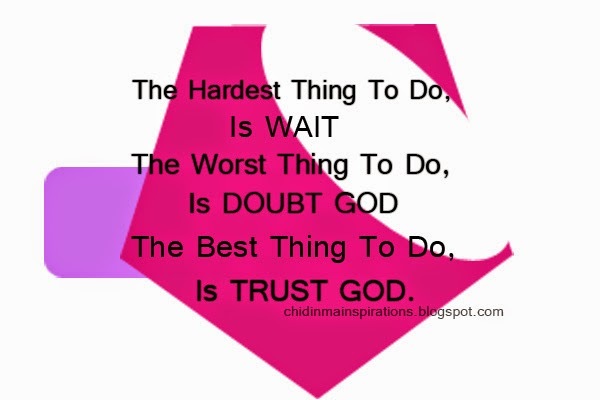 The hardest thing to ever do in life is to wait. Like a popular saying that says ''delayed but not denied''. You can be delayed from having what you want but you can never be denied of it unless God says so. The Bible says ''Who is he will say a thing and it comes to pass when the Lord has not commanded it'' Lam 3:17. Anything worth having is worth waiting for. Like the picture above, the guy wanted to be with his wife so bad that he had to do the hardest thing ever, which is to wait. While waiting, he already knew deep down that he was going to marry her. I am very sure, his friends and people around mocked him but he knew what he wanted and he waited for her no matter how long it took. Some people might have gone about it the wrong way. Some might have raped her, some might have manoeuvred their way to get the girl or set her boyfriend up so that they (the girl and her boyfriend) can break up and he can end up with her. 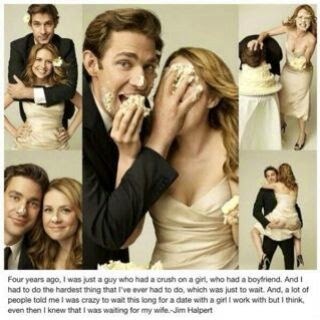 But Jim Halpert waited for her. Same thing goes for Jacob in the bible. Jacob worked for Rachael's father (the father of the woman of his dreams) a total of 14years just to be with his daughter. I am very sure, some people might be saying ''for what na?'' a slang which means ''why on earth will I do that?''. This is why the topic of this article/post is ''How bad do you want it?''. How bad do you want to graduate with a distinction/first class/good grades or graduate in general? If you want it bad enough you will wait for 3/4/5/6/7 years depending on your program or strike to graduate. You want your certificate so bad that you will wait for that number of years to get it right? How bad do you want your dream job? Though you might be working in a place you do not like or though you have being trying so hard to pass that job test or interview but all to no avail. Keep pushing, keep applying. As long as you badly want it and you have made your desire known to God, He will surely come through for you and you will get that dream job/job. But in the mean time, wait and while waiting keep putting your best in everything you do. Keep adding value to yourself mentally, spiritually, physically etc. How bad do you want that body? If you want a slimmer/ more fit body bad enough, you will try working hard to get it and then wait for the process to see your body transform to what you want. 1) God wants you to discover who you truly are. 2) God wants you to understand and appreciate what really matters. 3) God wants you to see things from His eyes. 4) God wants to teach or show you something so that in the end, you will say ''Now it all makes sense''. ''Now it all adds up''. If you are so focused on a destination, you will fail to see the beauty in the memories and life lessons you are gathering along the way. It is not about the destination but the journey, the memories gathered along the way, the life lessons learnt, how stronger you've become, how wiser you've become. In the end, you will realise that it was all about discovering yourself and seeing things from a different angle. Now I ask again, how bad do you want it? If you want it bad enough, you will be patient enough to get it. If this post has inspired you, please be kind enough to share it with others. Please also feel free to share your thoughts with us by commenting below. We look forward to it.